Discussion in 'Action Figures' started by MuppetsRule, Feb 2, 2006. Was just over at the Palisades forum. Came across this bit of possible great news! Really not sure what to make of all this but it does seem like good news. Maybe Palisades is undergoing more of a management change then a closing. We'll have to wait and see what this means for the Sesame Street line. Actually... It's not as much good news as you might think. Head on over to the "Palisades Is Coming Back!" thread in the Sesame Street section of the boards, and you'll find a response from Ken on what might be rully going on. Wishful thinking on my part, maybe? Maybe... But I can't fault you for that. There was a small shred of hope amidst the skepticism I harbored when reading through the article. And there's a post by Ken imported over to a thread titled "Production on Sesame Street" that doesn't bode too well either. Oh well, Palisades Toys, I salute you. Yeah I really would not hold out hope. *EDIT - OOPS. Better change my sig! Hi guys, sorry, I missed everything being stuck out of MC, but...pardon? Our resident Action Figure company has been going through tough times? Actually Bo... Here's what we know so far. A. Palisades Entertainment LLC. goes out of business and shuts down operations on 2/1/2006. B. The announcement's made the following day they've been bought by Licensed by CAS LMTD. (That's the name of the new company). C Not sure of the status of things like the Palisades Collector's Club shopping cart, or any of the lines that were started but never managed to get to retail like Sesame Street S1. I'm surprised to not see any news about this on the front page of any Muppet sites or much fan discussion...but from all the figure world headlines Ive seen, the headline is not 'Palisades Aquired by so-in-so' but "Palisades Toys Closes Its Door". Which is definate an end of an era and a sad passing for everyone who felt like they had a small hand in the company. I cant recall a toy company that ever was not just so involved with the fans, but brought to plastic so many wonderful properties. As a huge Muppet and Invader Zim fan, Palisades was a dream come true, and it's sad to see the company no more. Actually... Muppet Central was the first place to give us SS figure faithfuls a glimmer of hope when they posted an article earlier this week. Unfortunately, due to contradictory information from the company itself, it was somewhat doubtful and even erroneous, which is why I think Phillip took the article down from the front page. This year is the year the Sesame Street action-figure license died. I believe on the back of the Super Grover box, they made a big lie, a REAL big lie! Too bad they never produce any more SS figures and will never be released in stores! 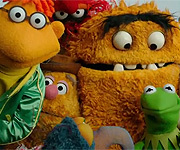 So basically, even the Sesame Street figures that WERE made will never be released. Such wonderful wonderful news! 2006 is getting off to a riproaring start, isn't it. I'm sure they will be released soon. Gosh, hope the Sesame Street line can stay afloat. Only if it gets picked up by some other company and actually sees the light of sunny days. Ok, lets make this clear. CAS ONLY bought the Palsiades name and left over product. That's pretty much it. This means they can distribute product that was already being sold, and if they ever make action figures in the future, any action figures, they can out the Palsiades logo on it if they want. That's all they did. They didn't keep any creative staff. There will be no Sesame Street action figure line with the Palisades logo on it. Very sad, but very true. There is no more Palisades. 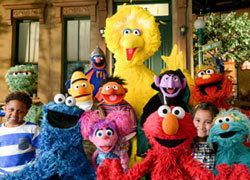 Any company can make Sesame Street figures if they get the license.